Over the past few years, the mantra of “doing more with less” has become so ingrained in corporate and business jargon that it goes unchallenged, unquestioned, and accepted as a legitimate business strategy. It is almost impossible to pick up a business publication, a newspaper, or read an industry blog without hearing the phrase. A quick Google search of the phrase yields thousands of news articles featuring businesses, non-profits, government agencies, schools, and even sports teams that are facing the challenge of “doing more with less.” Why should the loss prevention business be any different? This is not solely an issue in the United States. As I travel around the world and read local publications and talk to business executives in Europe, Asia, or South Africa, they face the same challenge inherent in this conceptual language. While this phrase might have been a well-intentioned response to budget constraints when we first started hearing it, “doing more with less” has risen to the level of unchallenged manifesto. It is only recently that we have started to see some challenges and questioning of the tenets of this philosophy and an examination of the implications of this as a business strategy. Several years ago, I wrote a column titled “Doing More with Less. Seriously?” for the RILA Asset Protection Report published by the Retail Industry Leaders Association. In this column, I took a look at whether this omnipresent catchphrase could be true, or if we are misusing it to avoid addressing key underlying issues in the way we manage ourselves, our people, and our workload in loss prevention. Out of the hundreds of articles, columns, and blog posts I have written over the years, I have never received the volume of reaction, feedback, and appreciation as I did to this one little column. I suspect this was because it resonated so well with those of you who live with this challenge every day. Of course, Maguire gets fired as a result. Speaking the truth is not without risk. In this article, we look at these issues and how we might shift our thinking about the phrase “doing more with less.” We will not pretend that budget pressures and resource constraints do not exist in the loss prevention business. Instead, we’ll look at how we might manage differently in this environment that goes beyond a buzzword or phrase. We could travel to a different destination. Those were the only possibilities I could come up with that would allow us to arrive on time. We are going to produce different results (“different destination”). Let’s look at the list in reverse order. The fourth option—different results—is often the actual result of cutting budgets, reducing resources, and eliminating payroll. It is not the intended outcome, but certainly a logical one. The third option is not one that many senior loss prevention executives would want to speak up about in a leadership meeting. Who wants to say they aren’t currently using all of their resources, especially when budget cuts and resource constraints have been occurring for several years as organizations have tried to squeeze more productivity out of their people? The second option is certainly the one that most of us like to believe is the answer. Perhaps there is a way to better leverage technology, to eliminate unnecessary or redundant processes, or to streamline procedures in a way that won’t affect desired outcomes. However, when pressed to identify specifics, most loss prevention executives have a hard time identifying what “synergies,” “efficiencies,” and “reengineered processes” are to be realized, especially, once again, when every company has been looking to do this year after year over the past decade. At what point is there no more substantive efficiency to be found? Finally, consider the first option—work harder, work more hours, and at a faster pace. In the world of aviation, jets can, in fact, fly faster than the original flight plan and schedule demands. But, this increased speed comes at a high cost—much higher fuel burn rates. This is probably a great analogy for the human costs and sustainability for having our loss prevention team work more hours or work harder. Can it be done? Certainly. But, for how long before effectiveness and efficiency start to drop? In reality, we use a combination of the above solutions to the problem, plus one very important coping mechanism that is not on the list. It doesn’t fit the definition of “doing more with less.” In fact, when we say that phrase, most of us don’t mean it literally. Usually, it is understood that our goal is to “do the same with less.” In other words, we are going to cut your budget, your payroll, and the resources available to you, but the loss prevention department still needs to deliver the same inventory shrinkage result or safety metrics. But all of the challenges enumerated above remain, and many loss prevention departments end up using one key tactic: we stop doing some things we were doing before. This could be a little less of everything or a complete elimination of certain tasks. For instance, we could go from auditing every location three times each period to only twice per period. Or, we could audit the same number of times, but not go as in-depth on each item and spend a little less time going over the results with the store manager. Each of these would be a way to do a “little less” than before in hopes that it won’t affect the desired results. Another strategy would be to completely eliminate certain questions or audit points from the audit, or stop conducting loss prevention audits in low-shrinkage locations. Again, the goal would be to eliminate certain low-value tasks in hopes that results are not impacted. 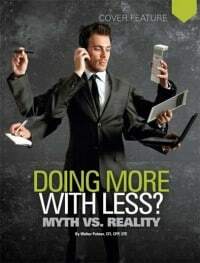 The point is that it’s probably unrealistic to think we are going to be able to “do the same with less” much less “do more with less.” Therefore, if we want to achieve the desired results, it is imperative on the part of senior management to be engaged in deciding what tasks and responsibilities are eliminated or done less thoroughly. Otherwise, those decisions will be made–consciously or unconsciously–by each individual in the field who is trying to squeeze 80 hours of work into a 50-hour workweek. If that happens you will have a tremendous amount of variance on what is actually being done in the field and when your results come in—good or bad. You will have a hard time evaluating whether to continue with current budget levels or not. Figure 1. DLPM Hours Worked and Days Required. Workload/Task Analysis—What Is on Our Plate? Once you have identified the tasks, you assign an average amount of time needed to properly complete each one and roll it up to a standardized work period. Let’s take a look at a retailer who recently did this very type of analysis for their district loss prevention manager position. First of all, they found the average number of hours worked per week was in the 53-plus-hour range (see Figure 1, top). This was not particularly shocking despite the fact that the job is, theoretically, a 42.5 hour per week job in their company. However, this is important information because it already starts to give perspective on the “work harder” idea. We are so used to bragging about how many hours a week we work that we tend to think that 53 to 56 hours a week doesn’t sound like too much. But that is a significant workload. Second, when they annualized how many work days it would take for them to get all of the tasks completed that they are responsible for, it came out to 378 work days a year (see Figure 1, bottom). Don’t forget, the “typical” number of workdays available to any employee working five days a week is 250. Even if you planned on a six-day workweek, every week of the year, there would only be 300 days available. Even if some of the methodology was off slightly, it seems clear that the gap is so pronounced that there is no possibility that everything on the list is being completed. Additionally, their task list did not capture very important aspects of the job, such as planning, strategy development, professional development, relationship building, and other qualitative activities that can have a direct impact on effectiveness. But, the story gets better. Over the past couple of years, this organization has been trying to “do more with less.” Part of that effort is to identify areas where one district loss prevention manager can cover two districts. Typically, they try to do this where there is relatively low shrinkage and good geographical proximity of locations. This is not an isolated case. Time and time again when organizations do these types of task analyses, we find there are gaps of 55 to 80 percent between available work hours and the amount of time required to complete all tasks per expectations. Time Tracking—Where Are We Really Spending Our Time? Another tool that needs to be used is to do some actual time tracking. This can yield different results than the task analysis since the task analysis is based on where we are theoretically spending our time versus the reality of where we actually do. This can be harder to accomplish as efforts in this direction will usually be met with skepticism from the workforce as they perceive it to be an attempt to micromanage their schedules or gather information with which to criticize them. However, the benefits of this information can be significant. Let’s look at another case study from another loss prevention organization that illustrates the power of this information. In this case, we had a high-growth retailer that was rapidly expanding, but not operationally competent at the field level due to the aggressive growth, including a major acquisition. Shrinkage was running approximately 125 percent higher than anticipated for their retail segment and footprint. There was pressure for higher earnings contributions to the parent organization due to expectations in the financial markets, so they were trying to grow aggressively while keeping payroll budgets flat. Additionally, based on the task analysis, the group was already 94 days in deficit to expectations on deliverables. By having this information, the entire dynamic of budget discussions changed. Of course, the CFO and budget committee wanted to keep payroll flat while the vice president of loss prevention wanted to add two RLPMs to handle the additional workload of 45 to 50 new stores. His second suggestion was, “How about we don’t do all of the investigations we are currently doing? Maybe the district managers of operations can handle the smaller cases?” There was consensus from the executive group that the DMs did not have the necessary skills to do this and that they needed to remain focused on sales and presentation standards in the stores. The loss prevention executive finally asked for suggestions on what other activities could be cut from the workload of the RLPMs. No one had any ideas. Guess what? 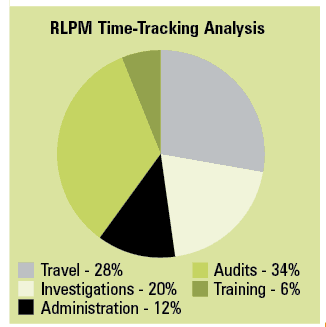 They budgeted for two new RLPM positions. In a loss prevention business environment that is moving more and more toward data-based decisions, and where the emergence of “big data” is one of the real buzzwords in corporate hallways, we are often in a severe data deficit when it comes to where our people resources are spending their time, what their task expectations are, and what is realistic to expect from them. This is not an article to complain about the workloads our employees are carrying, although there is significant evidence that there are severe costs in working long hours on a continuous basis. For instance, one study found that young medical doctors who worked longer shifts made almost 36 percent more serious mistakes. In the budget example above, the outcome was a “win” for the head of loss prevention. But, it could also have been a win without getting the two new positions as long as the service expectations were adjusted to align with reality. The biggest mistake is to try and deliver the same results and task deliverables while having resources reduced. Something has to give. Perhaps adding these data points to our tool box will help us better articulate the cause and effect of loss prevention resources on shrinkage and safety outcomes. Over the years, we have seen company after company go through the same cycle where, when results are good, they cut resources to the loss prevention team, as if the problem had been solved once and for all. Every time this happens, it is relatively easy to predict the pattern. Within a two- to four-year window, shrinkage trends up and increases in velocity in the wrong direction over time. This is when the organization reaches what my good friend, Adrian Beck from Leicester University in the U.K., calls the “tipping point.” This is the point where the results are so unacceptable that the organization believes something must be done. Often, they change the leadership team and, almost always, reinvest in resources for the loss prevention business effort. It becomes a priority once again. Perhaps it is time for all of us to collect the data on the things we do that affect shrinkage. This article was first published in 2012 and updated November 3, 2016.